Update 2-28-2017: Inogen 5 Year and LifeTime “Worry-Free” Warranty, Service and Maintenance. Main Clinic Supply Exclusive! Update 3-01-2016 – We now offer on ALL our Portable Oxygen Upgrades the option to have your machine “Replaced” or “Repaired” if you have a warranty issue. Your choice! What ALL does the Lifetime Warranty cover? Main Clinic Supply is the only dealer that offers a “Lifetime Warranty Upgrade” and “Lifetime Service Upgrade” that includes ALL routine service, software updates, and filter replacements. These services can save well over $2,000.00+ in a lifetime. Speedy warranty repairs and replacements as fast as the very next morning are included! Is the Company offering the warranty a factory authorized Inogen Service Center? At this time, Main Clinic Supply is the only dealer in the USA that is an Inogen Authorized Service Center. All products manufactured by Inogen One are state-of-the-art, but here is why you should consider a lifetime warranty and lifetime service plan for your Inogen machine. All Inogen oxygen concentrators come with a standard 3 year factory warranty. However, most people find that purchasing one of the upgrades below saves money and ensures the very fastest turn-around time. Main Clinic Supply offers Bundle Upgrades below that provide valuable accessories, yearly software updates, filter replacements, oxygen purity column replacement and any and all warranty repairs with option for a 100% Replacement. Inogen has, without a doubt, the most advanced and most intelligent portable oxygen concentrators on the market. Having said that, we all know that anything mechanical can breakdown and requires routine service and maintenance. When they do, having the best warranty and service upgrade in place for your machine is very important. 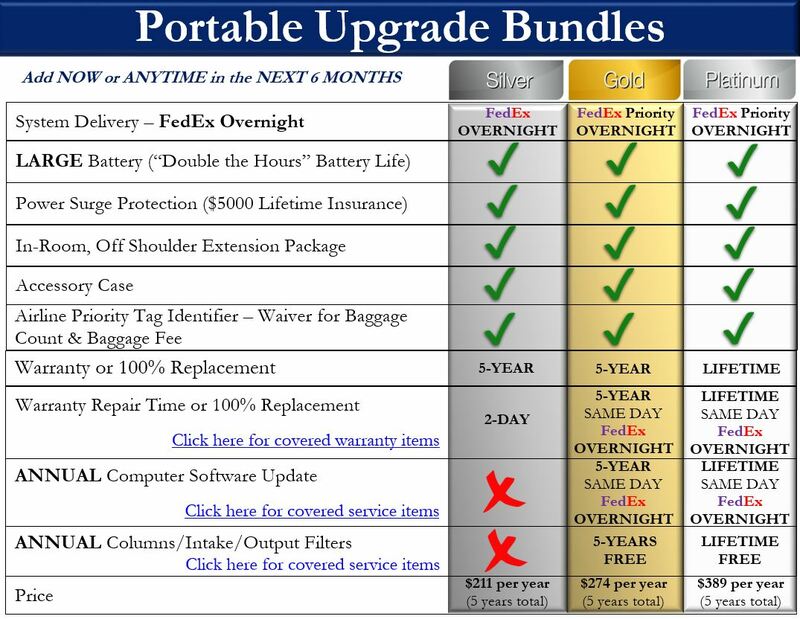 Below we show the upgrades we offer. These upgrades are exclusive from Main Clinic Supply. We are the only Authorized Inogen Dealer that is also Inogen Service Certified. Click below to see all the conditions that can be covered with our warranty upgrades.